No one loves a good soup or stew more than I do. That said, some soups get much more love than others when I post them here. 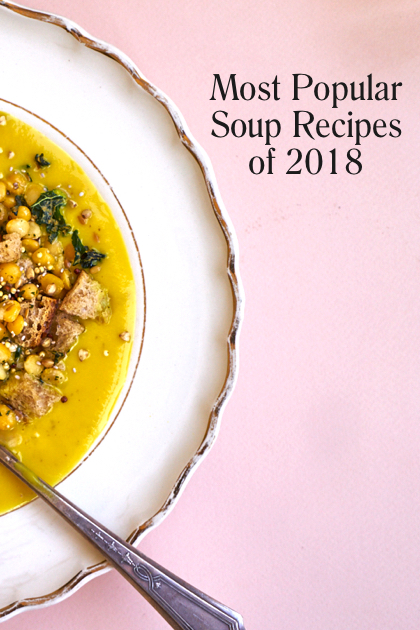 Seeing as we're deep in the heart of soup season, I thought I'd wrangle a list of the most popular soup recipes on 101 Cookbooks from last year, 2018. If none of those seem quite right, here's where you can poke around this archive of past soup recipes. 1. Best Simple Cauliflower Soup - If you are looking for a go-to simple soup with a short ingredient list. Boost it with a favorite yellow curry paste for a variation. 2. Spicy Instant Pot Taco Soup - A family fave. This taco soup is a hearty melding of beans, and corn, and taco spices, and quinoa. A great main to build a weeknight meal around. 3. Coconut Red Lentil Soup - A long-running favorite here. You're looking at a special lentil soup, an Ayurvedic dal recipe from the Esalen Cookbook years ago. Red lentil based, curry-spiced coconut broth with back notes of ginger and tomato, with slivered green onions, and curry-plumped raisins. 4. White Bean Soup with Pesto Herb Dumplings - Everyone loves dumplings. This is a hearty white bean soup topped with pillowy dollops of herb-packed pesto dumplings. Simple to make either vegan or vegetarian. 5. Curried Tomato Tortellini Soup - Another family friendly fave - a lentil and tomato-based stew, dotted with plump, tender dumplings, spiked with a range of spices, and boosted with plenty of spinach. Perfect one-bowl meal. 5. Vegetarian Split Pea Soup - Perfect for a busy weeknight, this delicious, simple vegetarian split pea soup is made from the shortest list of ingredients. 7. Instant Pot Minestrone Soup - This was popular with Instant Pot enthusiasts. A fairly classic minestrone, made with dried beans, not canned. 8. A Simple Carrot Soup - Another simple blender soup makes the list. The base of this carrot soup is spiked with dollop of red curry paste, and then pureed into silky oblivion. 9. Ten Ingredient Alkalizing Green Soup - The quintessential wellness soup. A unique mix of spinach, herbs, garlic, with silky coconut cream, and some green split peas for staying power delivers a potent, alkalizing green soup. 10. CAP Beauty No Bone Broth - This mineral-rich alternative to animal bone broth was super popular. 11. The Creamiest Vegan Soup (Cauliflower) - This soup is different than most "creamy" vegan soups I come across. It uses a clever trick to achieve its texture. 12. Vegetarian Tortilla Soup - Put in the effort to prep the baked tortilla matchsticks, which act as a perfect contrast to the full-bodied, spicy brothy vegetarian soup. Everyone needs an arsenal of great noodle soup recipes for winter. Here are twenty fantastic options from ramens and pho, to soba bowls.